Despite our late arrival after midnight the night before, we awoke early on Sunday morning, February 20. 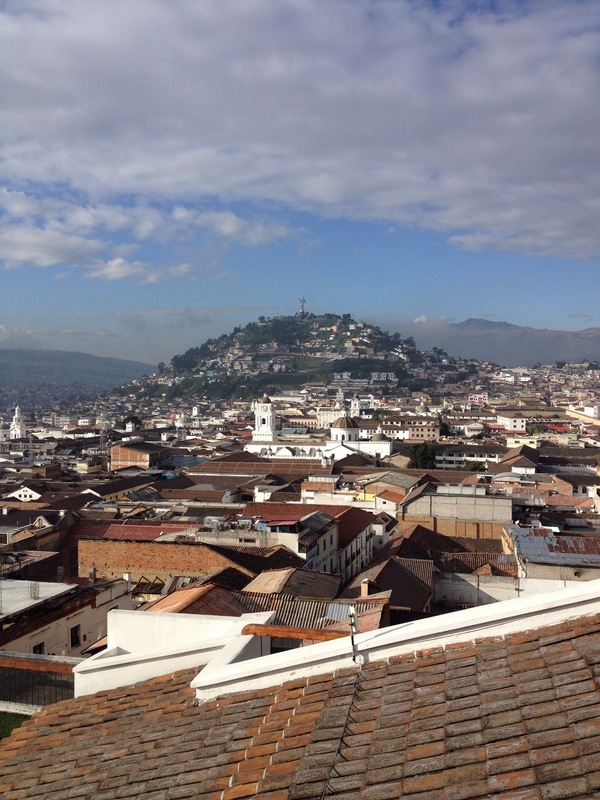 We were amazed by the exquisite view of Quito’s historical center (“Centro Historico”) from the balcony outside the bedroom of our apartment (see photo). As eager as we were to explore this new place, however, we did something unusual, after a small breakfast of fresh fruit and coffee: We took a morning nap. It was luxurious. We were still very tired after the journey from San Jose through Panama City and Bogota. An hour or so later, sometime after 10:00, we locked the door of our apartment behind us and headed down the steep short hill into the Centro Historico. The weather was glorious, clear with high cumulus clouds and a mild comfortable temperature. It was Sunday. I was in search of a Catholic church to fulfill my weekly mass obligation. My lack of proficiency in the Spanish language leaves me at a great disadvantage, but at least with the formal mass I can follow the structure and scripted prayers. I have traces of memories of Latin from my years as an altar boy, back in the mid-1960s when the mass was still celebrated in Latin. One impression I took away from the churches in Costa Rica, besides the sweet faith of the people themselves, was that the priests seemed rather severe and humorless. Their sermons were long and were received in silence by the faithful. 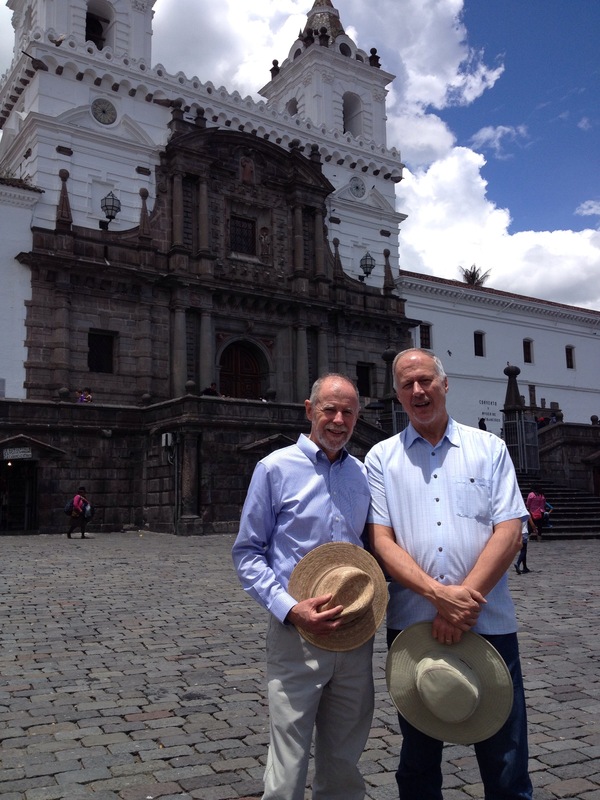 In Quito, in contrast, at the first of the churches we stopped in, the priest was lively and had a friendly tone. He seemed to encourage an animated back-and-forth dialogue with the congregation. All of the churches in the Centro Historico are quite beautiful and very old. Upon reflection, we realized that they all predate — to choose two examples — William Shakespeare and Wolfgang Mozart. Most of these churches in the Centro Historico were built less than 100 years after Columbus first landed in the New World. On the one hand, they and the other colonial-era structures in the Centro are a testament to the brutal efficiency of the Spanish Empire. Consider that the Spanish arrived here on ships that rounded the Horn of South America, and marched hundreds of miles over unfamiliar territory to find — and conquer — the large Inca settlement here at Quito. On the other hand, the churches of the Centro are temples of solace and lasting beauty for the common people of Ecuador. The faithfulness of the people here is a moving thing to witness. A Sunday in the Centro Historico is an ideal time to visit. The streets are closed to automobiles, and great throngs of people can be seen enjoying themselves and filing in and out of the many churches. In every church, masses are celebrated before full congregations. The faith is strong. Has this country not suffered, I am inclined to ask, the scourge of sexual abuse of children by its priests? How has it avoided the widespread loss of faith we have witnessed in the United States and throughout Europe? Somehow here the faith of the people endures. At the first church we visited, I took communion. We noticed how lots of people, after receiving communion, remained gathered at the front of the church by the altar. We were puzzled at this unfamiliar ritual. At the conclusion of the mass, after the final blessing, the priest — a very good-natured guy we could tell — used a bouquet of fresh flowers to splash the crowd with holy water. He moved methodically from left to right, repeatedly dipping the flowers into the bucket of holy water and energetically spraying the crowd, who responded enthusiastically. The people as they left the church will filled with the most joyful, spirited expressions. It was very moving. Rest assured, our walking tour of the Centro Historico that first morning here in Quito was not confined to religious shrines and experiences. We saw the Presidential Palace and lots of other sites. We especially enjoyed the large, easygoing crowds, made up predominantly of local people, with very few tourists in evidence. But in all candor, the most striking and emotionally moving aspect of our first day in Quito, in the Centro Historico, was the deep, unassuming and old-fashioned spiritual faith of the people here. Glad you got that morning nap in! I so enjoyed reading about your going to mass in Quito. I have noticed friendly and also severe priests in the US. Wonderful guys. I am going to enjoy Blog I am sure. Great writing and good story telling is what I like. Just a few more photos please. 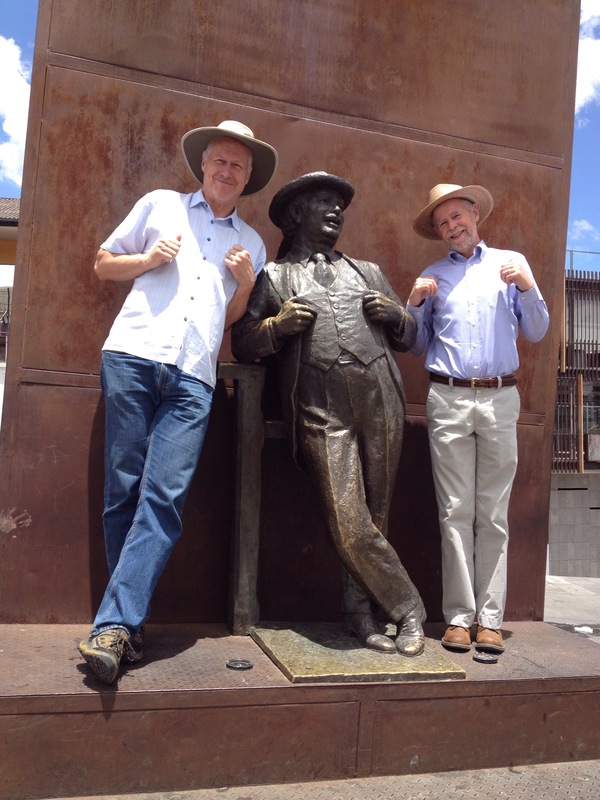 Who’s the dandy posing btw you two (the statue)? Great pictures! When my brother and I were in Rocio, Spain for the celebration of the virgin, we found the religious fervor to be very intense and dramatic. It was so culturally different from our US Catholic experience. It was quite a sight to see.